GET $500 Off Your man cave project! Special Limited Time Offer on your custom Man Cave Project with Smartland! Call now or fill out the form on the right and use the promo code "MCP-500-OFF" to get $500 off your custom man cave project with Smartland. Don't let the custom man cave of your dreams be delayed any longer, ask your Smartland representative about our new unbeatable financing options and get your project in motion! When most people think of a “man cave” they think of couches, big recliners, and even bigger TV screens. 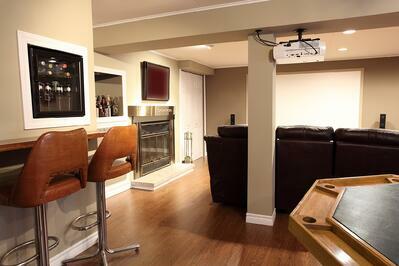 Those are great things, no question, but custom man caves can go well beyond that. Build your own neighborhood basement bar, game room, theater, or sports bar with a custom man cave built by Smartland. Here are some ways Smartland can customize your man cave so that a visit to this room will feel like a little vacation just for you — even if you never step foot out of Cleveland or Northeast Ohio. Bars — Wet or dry, large or small, with refrigerators, kegerators, beer taps, and plenty of bar stools. Don’t like beer? 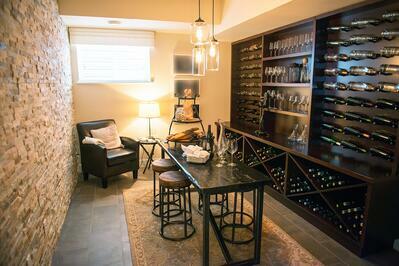 How about a wine cellar, a coffee bar, or a basement bar? Games — Billiards, card tables, ping pong, foosball, air hockey, arcade video games, pinball machines, and dart boards are the norm, but you can take custom man caves to another level with bowling alleys, putting greens, basketball hoops, and even batting cages! Gyms — We’re not talking a weight bench in the corner, we’re talking circuit trainers, ellipticals, treadmills, rock climbing walls, and boxing rings! Home Theaters — You don’t have to just watch sports in a man cave; bring the thrills of going to the movies to your home, and save on the insanely high prices of tickets and popcorn. Studies — Just want a quiet place to read? Custom man caves can also feature bookshelves, magazine racks, and comfortable reading chairs. Hobby Rooms — Do you collect unique items? Into model trains? Need a good woodworking space? Custom man caves can be designed to fit any hobby you have. Themed Rooms — Old west, rock ‘n roll, log cabin, a ship’s captain’s quarters; your only limitation is your imagination! Custom Bathrooms — Custom man caves can feature bathrooms complete with TVs, phones, urinals, and more. And you never have to worry about putting the toilet seat down! Contact us today and let us turn your ideas into realities.